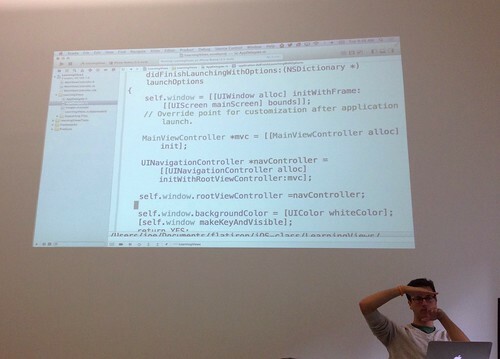 Today, we started the Morning Lecture by discussing the view hierarchy in Cocoa: UIWindow, rootViewControllers, mainViewControllers, Views, UIButtons, UILabels. We started a project called “LearningViews” to illustrate this hierarchy. We then injected a NavigationController to see the awesome that you get with this class. Then we started diving into NavigationController mechanisms of presenting / dismissing Modal ViewControllers and Pushing / Popping View Controllers. We then went into Delegates before heading off to lunch. No working lunch for me today as we took to some much needed Cuban at Sophie’s. Each pair had to write an example app showing the delegate and prepare a quick presentation for the class. After each of the four pairs presented we had a Design Lab where each pair designed a Super App with all four Delegates into one App using a UI Stencil. We then traded these Stencil Specs and coded the Apps in pairs. The Afternoon Lecture focused on Coding Your Own Delegate & Protocol by continuing the “LearningView” App and adding a protocol and delegate. Tomorrow, we will dive into TableView Delegates and we have Homework #3 due tomorrow night. HW3 takes us back to the QuizMe App – starting fresh and adding a difficulty level, the ability to enter question and answers, maintaining a singleton data store, and using Core Data for Extra Points. It’ll be good to start that tonight. One App to note is the App Joe used to Prototype On Paper the Homework flow. You can design on paper, take pictures with your iPhone, and then Simulate the App on their website with hotspots and transition effects. Very slick. Try POP on your next big App Design.